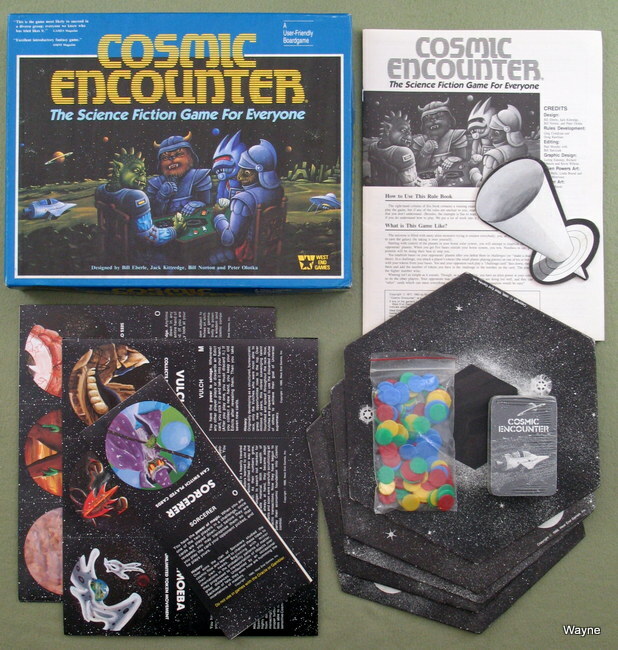 Box art with the alien moonscape is the 1977 edition. 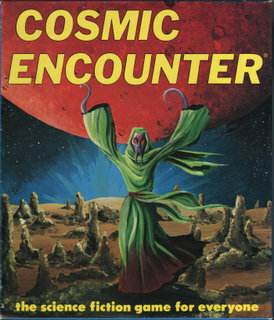 Lid art with the robed tentacle creature is the 1978 edition. The contents are identical. * Hexagons: 4 planet systems, each with 5 planets; and a central section containing the Space Warp for lost tokens. * Tokens: 4 sets of 20 colored tokens, representing Beings. 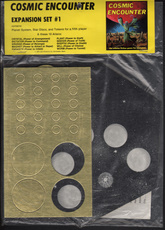 * Star Discs: 4 sets of 4 discs, colored to match the tokens. * The Deck: 54 cards, including 46 Challenge cards and 8 Edict cards. * Alien Power Cards: 15 cards, each illustrating an Alien Being and describing its unique power and history. * Hyper-Space Cone: A moveable piece used to carry players' tokens into a challenge. "A Science Fiction game for 2-4 players, average playing time 45 minutes. 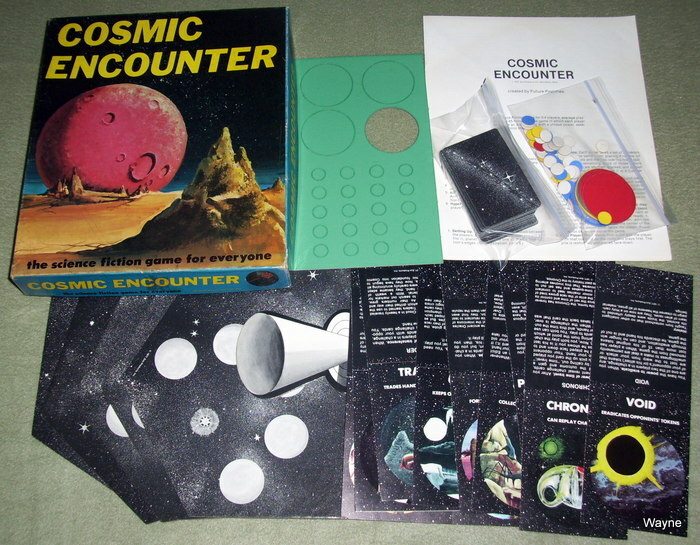 The game in which each player becomes an Alien Being with a unique power, seeking to control the universe." • Playing Board: Showing the seven domains, each with several "areas" — a tower, a castle, and various geographical areas. Also shown is an area marked exile. The playing surface off the board is the overworld. • Matrix Screens: Four color coded sets. The 3 notched pieces of each set fit together to make a screen to be placed in front of a player. • Clan Tokens: Four sets with 15 of each color, numbered 1 to 10 with duplicates of the odd numbers. Each set represents a player's clan. • Power Discs: Eight sets of 3, each showing a Keeper, Starstone, or Sword. • Peril Chips: Thirty-six in all, 4 swords, 1 fire, 1 fire-watch, 1 snow storm, 1 kite, 1 Ghost Wind, 1 Chieri, 26 psychic spells valued 0 to 3. • Plot Cards: Four sets of 6, each showing one of the domains surrounding Elhalyn. • Monitor and Crown: 1 of each. "Based on the best-selling science fiction novels by Marion Zimmer Bradley. — where players compete in fierce psychic struggles. — where players seek revenge by hurling deadly forces from the Overworld to destroy their enemies. — where daring strategies and unique psychic gifts lead to quick reversals of fortune. — where players conceal their own feelings while luring their opponents into dangerous emotional outbursts. — where the mysterious Ghost Wind unleashes bizarre human behavior and threatens to reveal players' secret desires. — where the mounting tensions are suddenly resolved in gut-wrenching laughter. 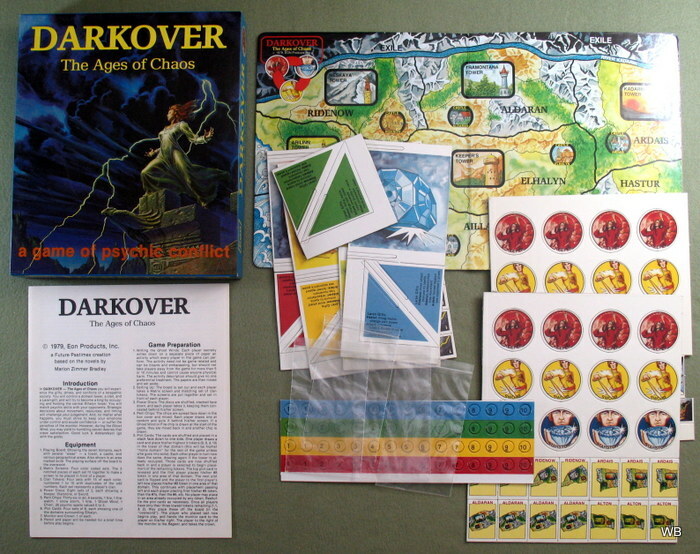 Darkover — a Future Pastimes creation"
"Like the splitting of atoms, RUNES breaks words down to their most basic elements, then builds them up into an alluring game that's both verbal and visual. 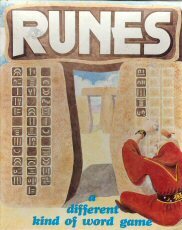 Play RUNES and discover the hidden language that lies within the very letters themselves."